Tripura gets its third English daily on Thursday in the form of ‘North East Colours’. 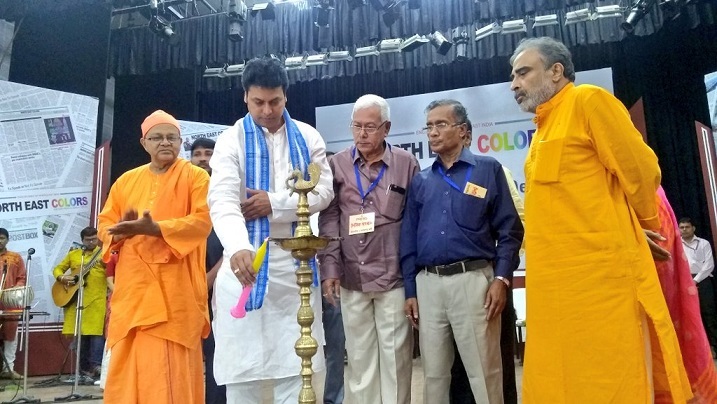 The launching programme was held at the Agartala Town Hall in the state capital that was well-attended by top politicians, litterateurs, social activists, veteran journalists and eminent personalities from various fields. The ‘North East Colours’ has been brought out by the ‘Bhupen Dutta-Bhowmik Trust’ which runs Tripura’s largest circulated Bengali daily ‘Dainik Sambad’. The launching programme began with an invocation with to Lord Ganesha and Goddess Saraswati followed by a luscious ‘Hozagiri’ dance performed by a Reang tribal team from Santir Bazar. Inaugurating the launch programme, State Chief Minister Biplab Kumar Deb expressed his satisfaction over the publication of the new English daily and assured that his government will always remain give media its due honour and importance. Suman Chatterjee, editor of popular Calcutta-based Bengali daily ‘Ei Samay’, who was present on the occasion while highlighting the rights of media also laid stress on its role and duties towards the society. Swami Hitakamananda of Ram Krishna Mission, while addressing the august gathering pointed out certain lacunae and error in media functioning and called for its redressal.